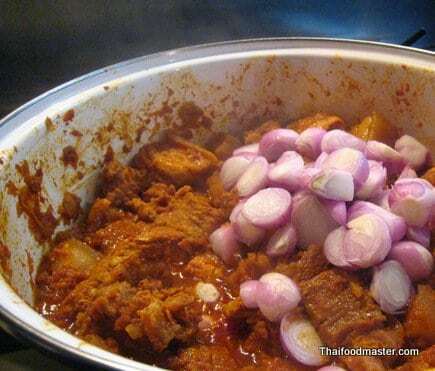 If you like curries with the thickness and complexity of the Massaman Curry, you will enjoy this salty, sweet and sour dish. 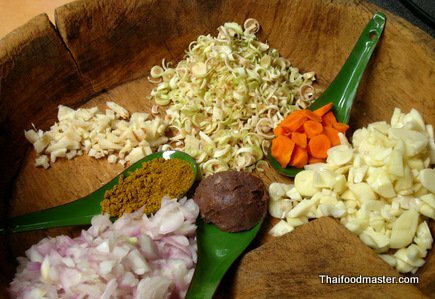 Clean, peel, chop and prepare all the ingredients for the curry paste. 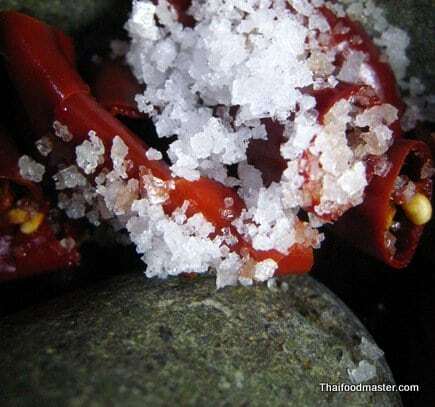 Soak the chilies in water until soft. 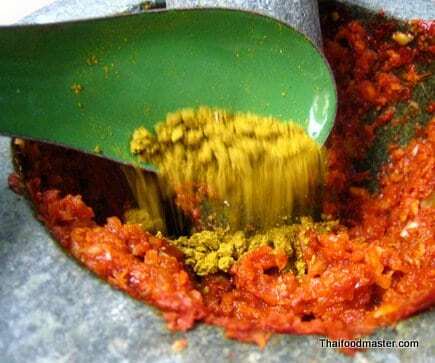 In a mortar and pestle, start pounding the chilies with salt as an abrasive. 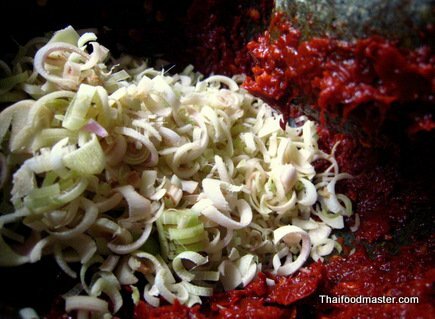 Add lemongrass and pound it finely. Add galangal and pound it finely. 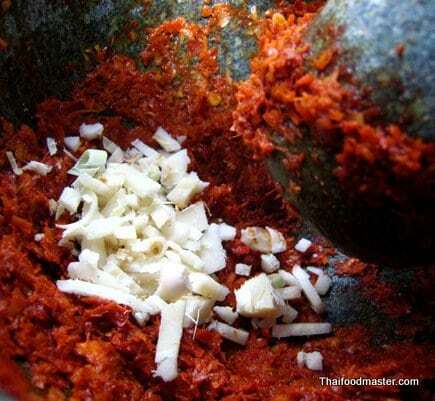 Add shallots, garlic and fresh turmeric, and pound everything to a fine paste. 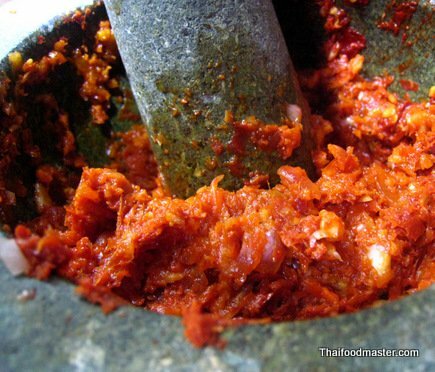 Add hang lay masala spice mix. Add gabpi and mix well. Set aside. 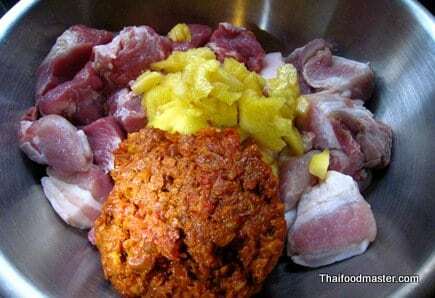 In a mixing bowl mix the two kinds of pork cuts cubes with the pineapple and all the amount of curry paste. Add thick dark soy sauce and mix well. 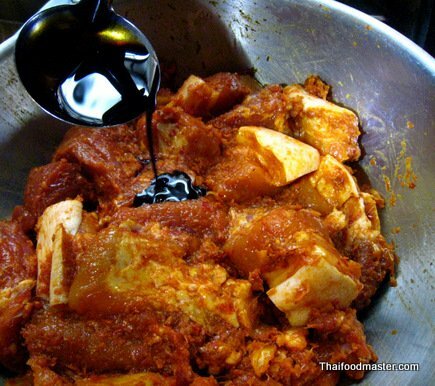 Let the pork mixture to marinate for at least 1 hour. 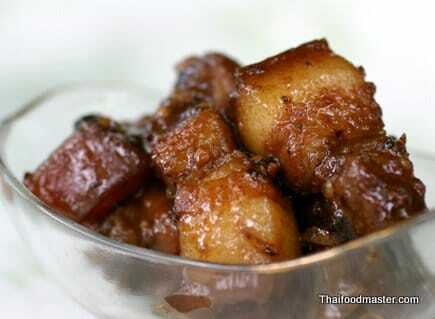 Fry the pork mixture on low heat until the fat renders out. Add shallots and ginger and mix well. 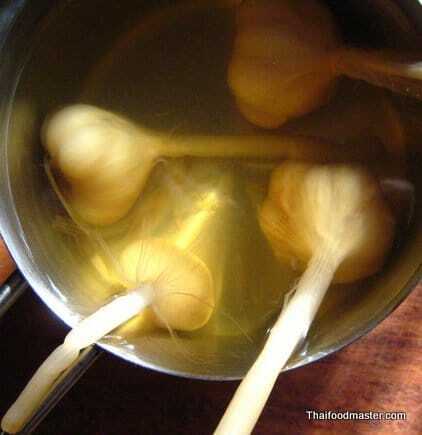 Add pickled garlic and its brine. 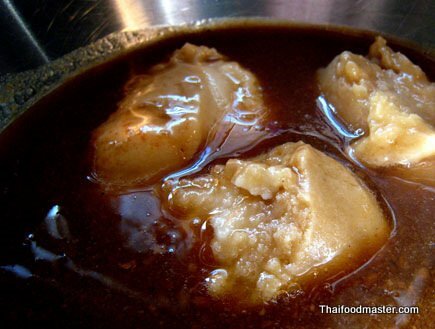 Season with tamarind paste, fish sauce and palm sugar. Simmer on low heat for about 1 hour until pork is soft and sauce is thick. 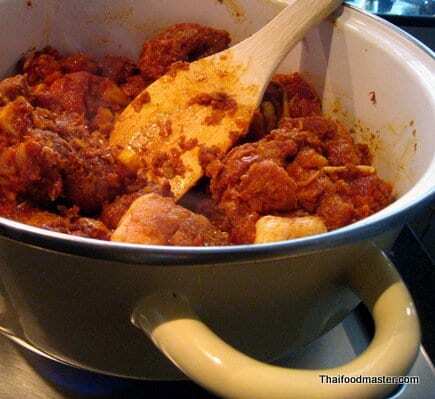 This is an aromatic stew that leans into the sweet spectrum of the palate. 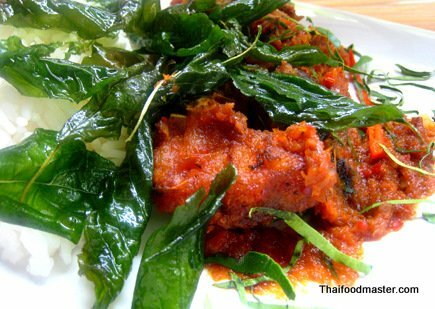 An all-time Thai favorite, moo palo was introduced locally by the Chinese-Cantonese and Tae Chiew immigrants who flocked to the Kingdom in the early nineteenth century. 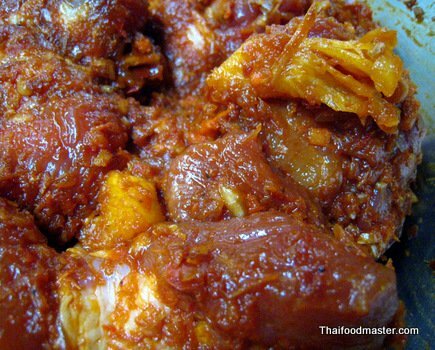 The name of this dish originates from two Chinese words: pah ziah and lou. 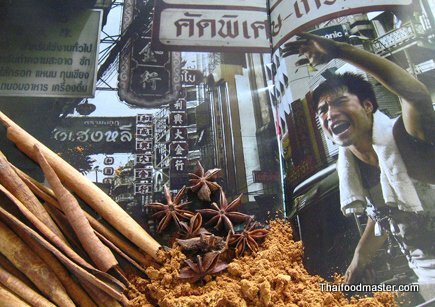 The food culture of Phuket, like its architecture, blends western colonial, Hokkien Chinese with Muslim and Thai motifs. 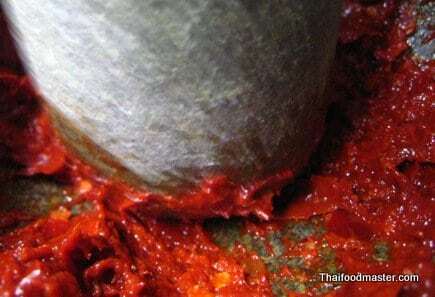 The Hokkien Chinese who arrived from Singapore and Malaysia introduced Muu Haawng to the repertoire of the Phuket Thai style cuisine (bpoon dteh ; ปุ้นเต่). 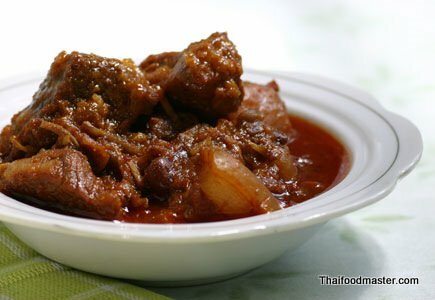 It is very similar to the Teochew style Phalo, but here there is no use of Chinese five-spice powder, instead it is relaying only on soy sauce, sugar, garlic and black pepper to create a thick gravy that color the pork with a caramelized shiny red and tempting sheen. This recipe seems a little odd to me. 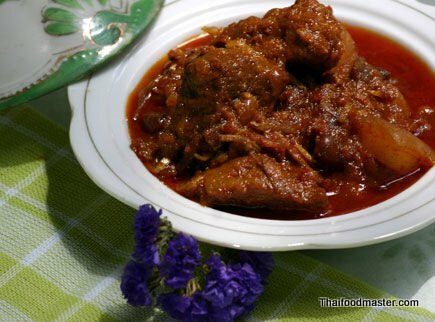 It has the usual ingredients of this curry – the pickled garlic, peanuts and dried spices. 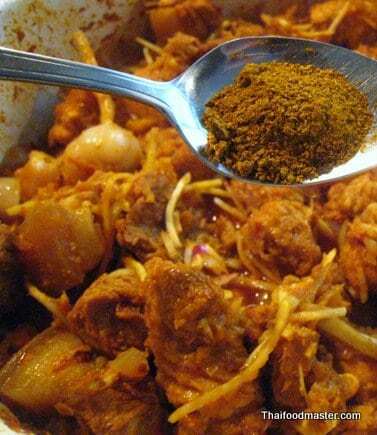 However, I’ve never encountered it with pineapple in before (and it’s one of my favorite curries, so I eat it quite often), and the addition of raw spices without their being fried seems odd. I was therefore wondering what the source of the recipe was? How authentic do you think it is? Nice., i really like north foods and You have the ability. I knew your website from watching TV show on Channel 9 a couple month ago. 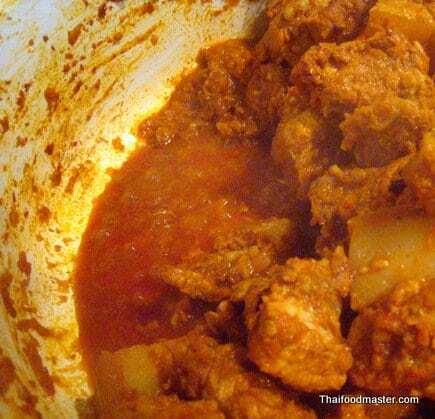 This time checked your website again, and found out that you have a recipe for Hang Lay Curry. It seems that you have a nice job for having this recipe. However, to reserve anthentic food and recipe I would prefer not having peanuts in the curry. I hope you wouldn’t mind if I like to continue the last comment. 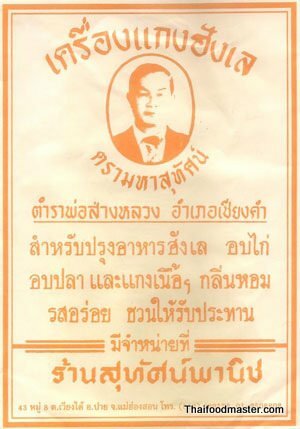 I asked people on the street since I live in the Northern of Thailand. 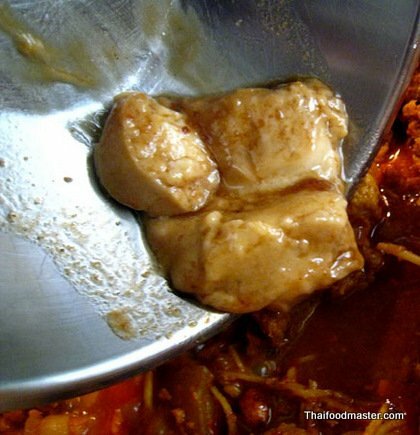 Some say they add peanuts in the Hang Lay curry, but some don’t, just like you already mentioned. 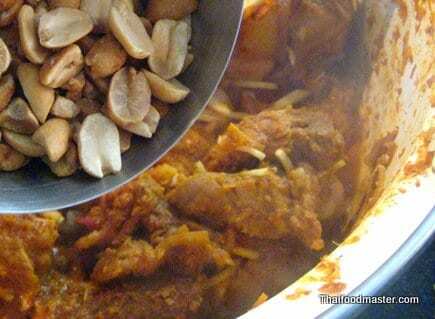 For those who don’t add peanuts mentioned that it’s not Mussamun curry. 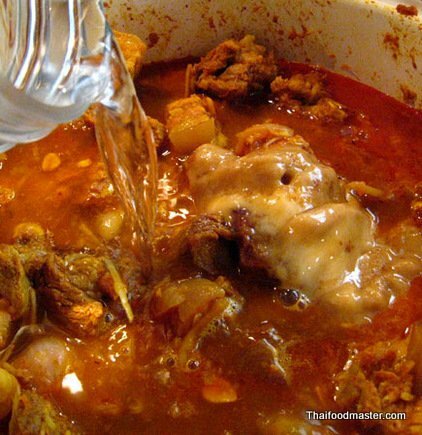 The interesting thing is others add santol (กระท้อน) in the Hang Lay curry, instead of adding peanuts. 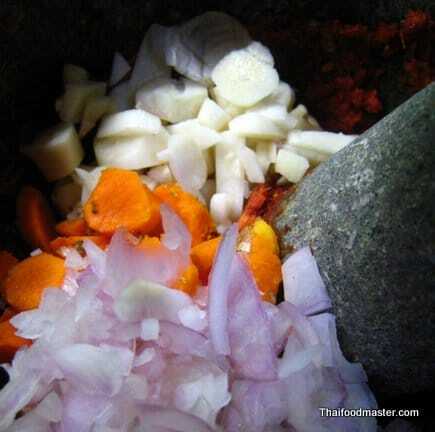 Today, we will cook the curry with santol. It may be my first time to have that. You may like it too. Thanks for the info. I heard before about adding grathaawn but never tasted it in a geng hanglay. please let me know how did the dish come up! 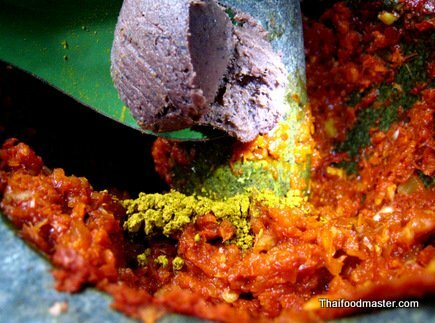 very interesting curry. but the amount of ginger is unusual to say the least, is this an error? No Michael, It is not an error ;-) Try it and let me know how it came out. Thanks for the response. I have travelled extensively all over Asia and love Asian food, but I have never seen 3 cups of ginger to just 1Kg of meat before. 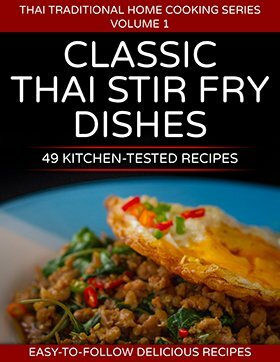 I shall definitely try this and compare to other recipes I have tried, that only says 1/4 to 1/2 cup. You are either a ginger lunatic or an absolute genius. I can’t wait to find out. Well, I tried the recipe with the 3 cups of ginger and it was as I thought it would be, too much ginger for my taste. Although it was not as overpowering as I thought it would be. It did however overpower the other flavours so I will cut back considerably next time. Apart from that a very good recipe. 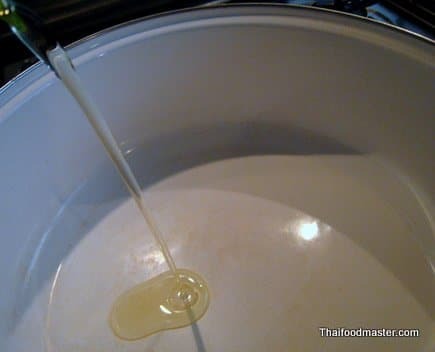 I would like to comment in general as I notice you only provide a video for the method but no quantities for allot of the recipes. I f you could provide at least an ingredient list with quantities to go with the video that would be much appreciated. Thanks for the website, keep up the good work. Hello from Australia and thank you for having this area to ask questions. 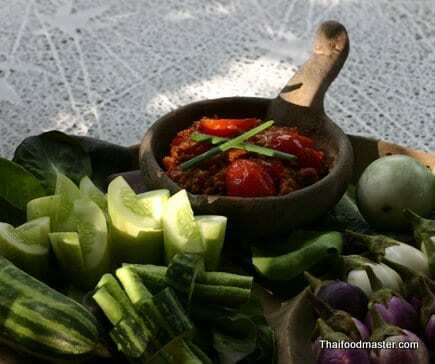 My husband and I were in the north of Thailand in Chiang Mai about 11 years ago and visited the Cultural Centre to watch all the different dancing and taste authentic Thai food. I’ve been trying to find a recipe for the pork dish which was probably the best flavour I’ve tasted ever! 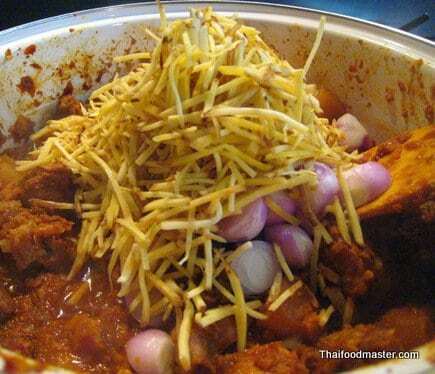 In a Thai Restaurant recently I was talking to the owner who is from Chiang Mai and discribed the look and taste. 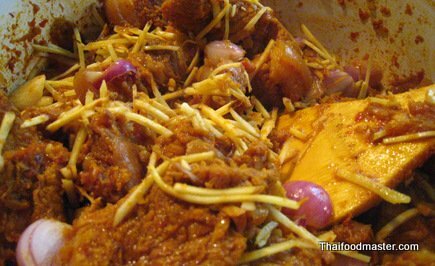 She said it had to be Kaeng Hung Leh Moo. It was a pork dish, quite dry and a deep reddish brown colour. It wasn’t hot to the taste but so rich and the large pieces of pork were extremely tender. Is your recipe and my description the same dish. I remember it looking drier than your photograph. Love to hear from you. Wish we could jump on a plane and go back. Loved the north of Thailand soooo much. Thank you Dianne. Hello Dianne, Sounds like it. 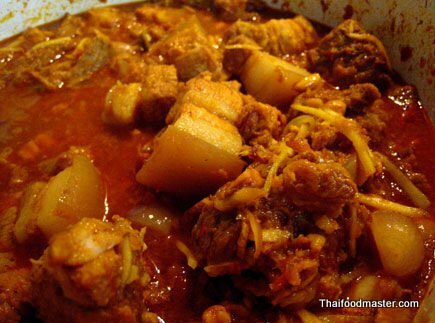 This is the recipe for HangLay curry. Give it a try !